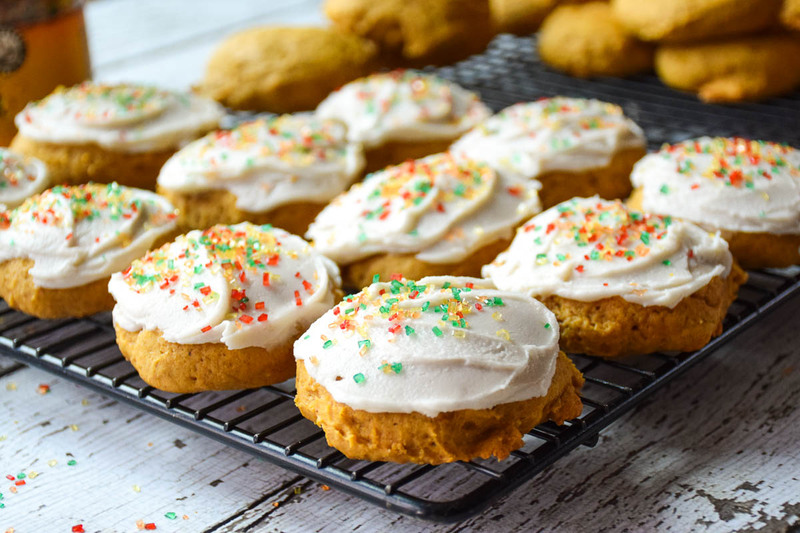 Soft Pumpkin Cookies with Buttered Rum Frosting are full of pumpkin flavor! 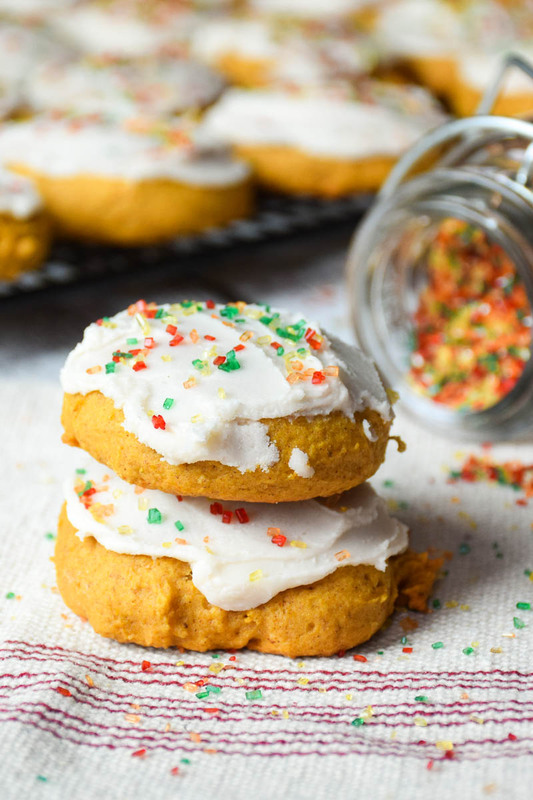 Decorated with fall sprinkles, these make the perfect fall cookie! 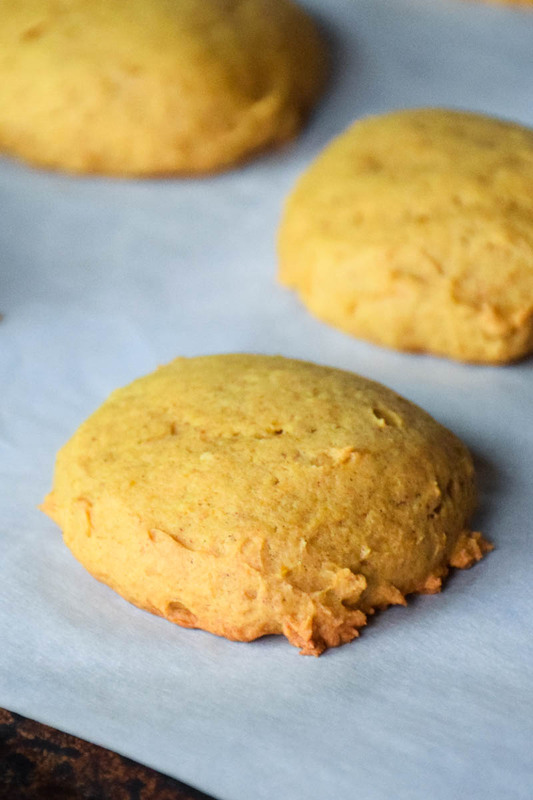 Great for parties or for sitting on the deck enjoying the fall weather with a cup of hot tea these soft pumpkin cookies are sure to give you that comforting feeling! 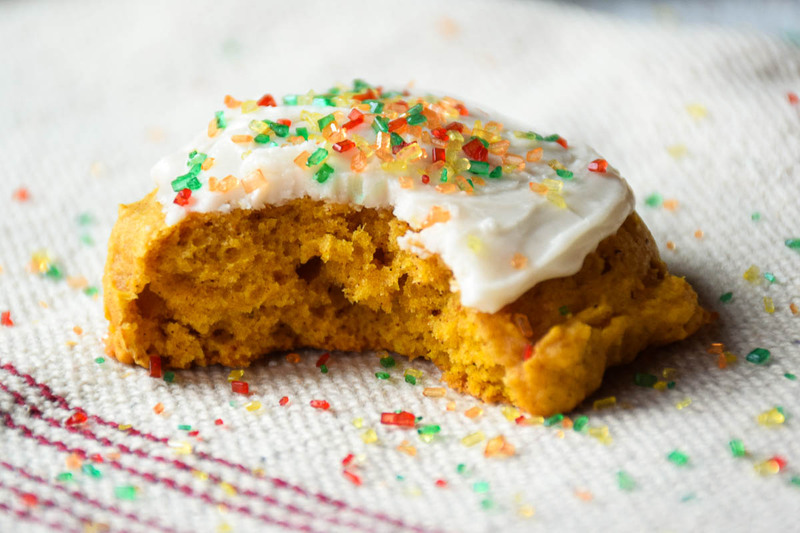 These are also the perfect beginning to #PumpkinWeek! 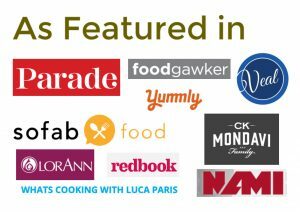 Pumpkin Week is the time where a group of food bloggers bring you all things pumpkin! 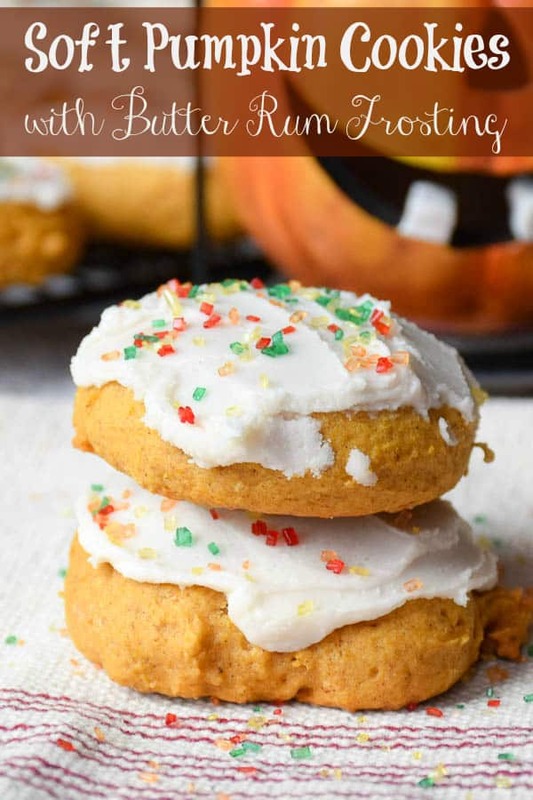 I am sharing with you my very favorite cookie for fall, the Soft Pumpkin Cookie with Buttered Rum Frosting. For me, this cookie is the first food I must make for the celebration of fall. 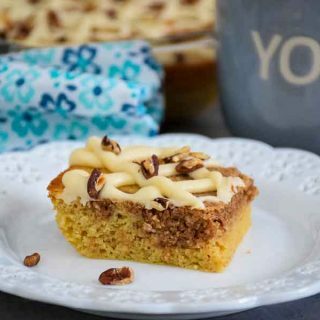 Fat, soft, moist, full of pumpkin flavor all accented with the perfect pairing of rum! Of course, the fall colored jimmies top it off perfectly! 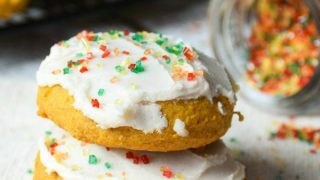 I have made this particular soft pumpkin cookie recipe for years now and all I can say, is it never fails me! 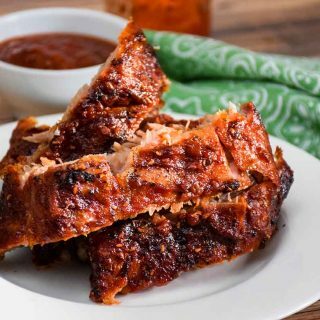 It comes together quickly and easy and only takes 15 minutes in the oven to bake. Your house will smell heavenly! 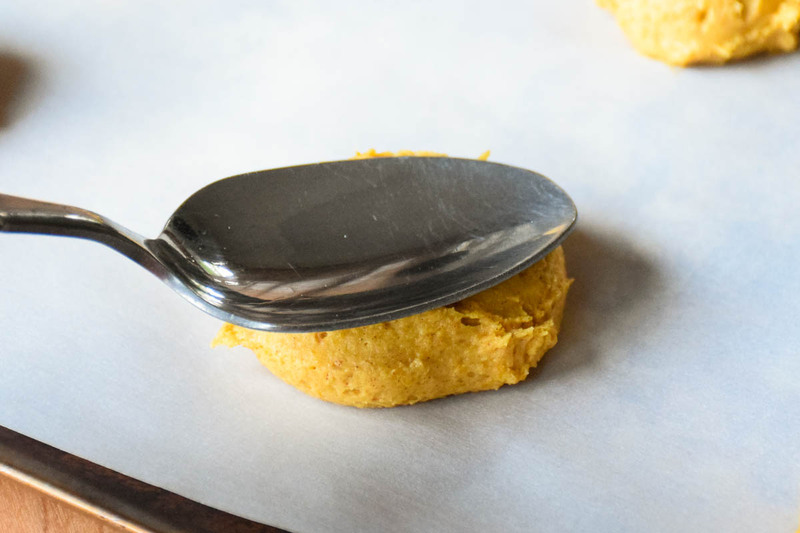 Tricks of the soft pumpkin cookie flattening trade! As I have made these over the years I have come up with a few tricks to have them turn out perfectly. My small cookie scoop is the best cookie baking tool. It scoops the perfect amount of dough for the cookies, there is only one problem. 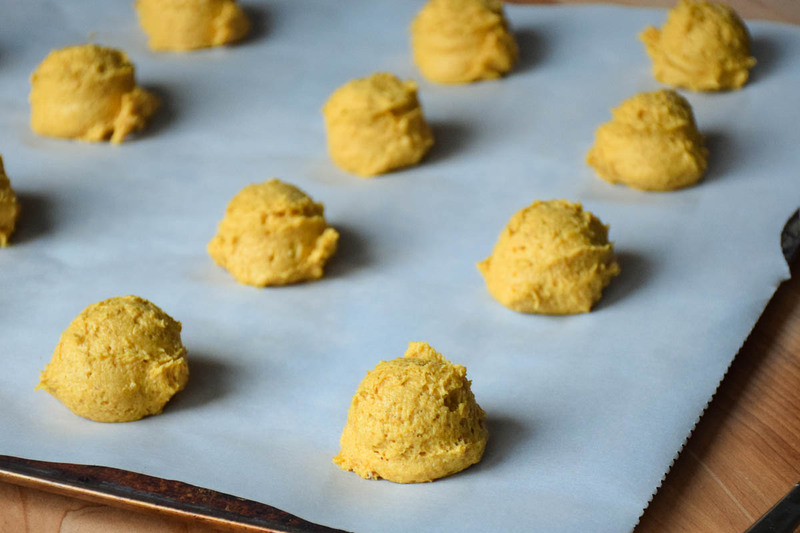 Sometimes the particular recipe is a dough that holds it shape when baking, like these pumpkin cookies. 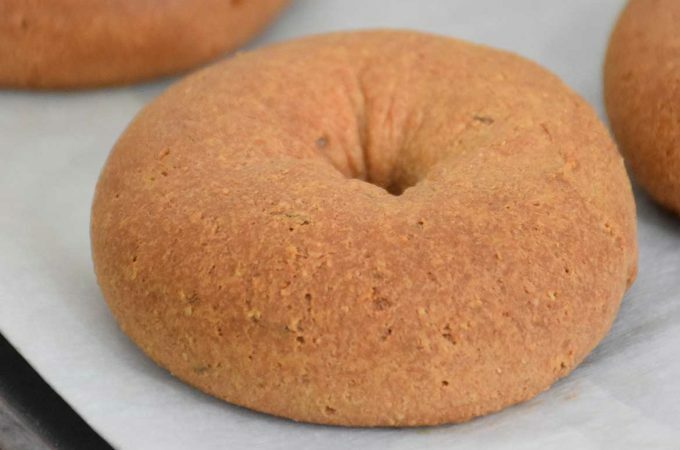 I have tried many ways of flattening the dough out some. I’ve used the bottom of a glass dipped in sugar which works pretty well. I’ve also used the palm of my hand, which is not recommended. It’s messy and the dough sticks to your hand. My biggest problem when trying to flatten the cookie out is the instrument used for flattening sticks to the cookie. The solution I came up with that works perfectly for this recipe is the back of a silver spoon that has been dipped in water! Just dip the back of the spoon into a small amount of water before pressing each cookie to flatten it out some. 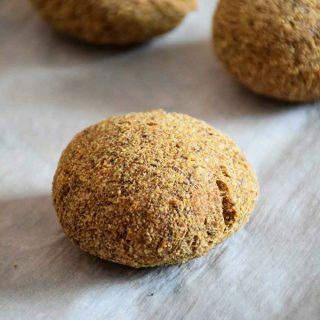 Bake at 350 degrees for 15 -20 minutes, or just until they are dry on the top and no indentation is left when pressed slightly with your finger. 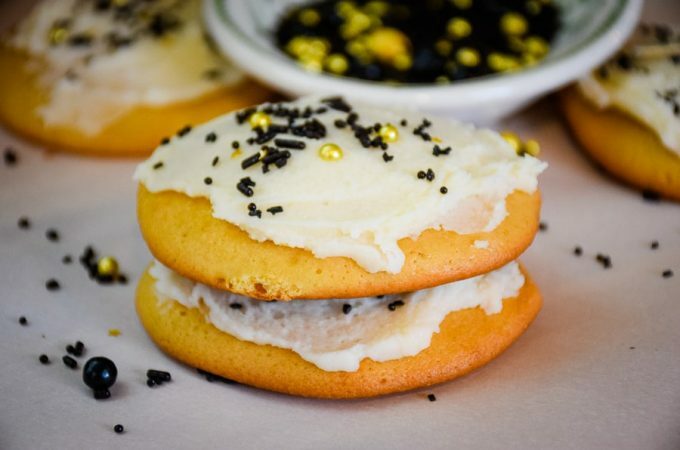 Cool and frost with a buttered rum frosting. 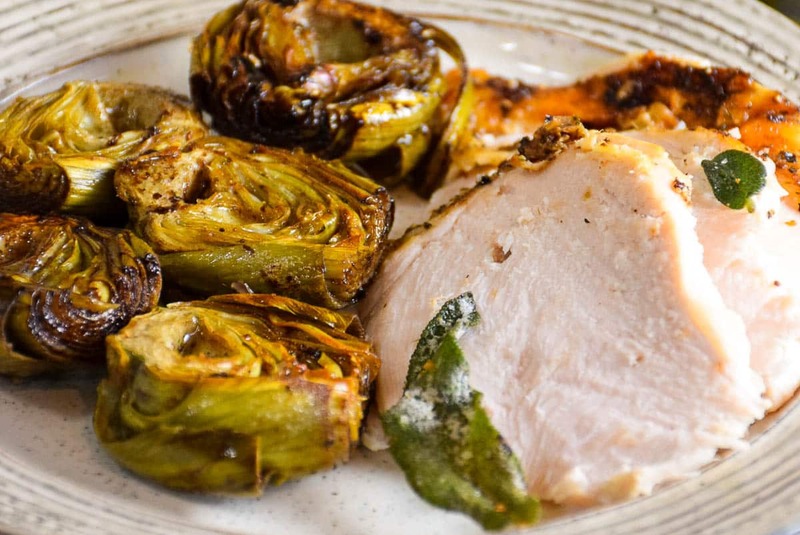 These two flavors meld together perfectly and speak fall loud and clear! What is your favorite pumpkin treat? 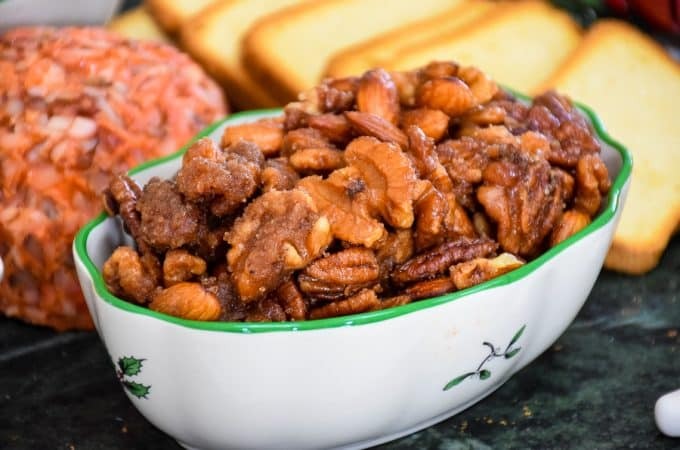 Be sure to check out the links below the recipe for some more pumpkin inspiration! 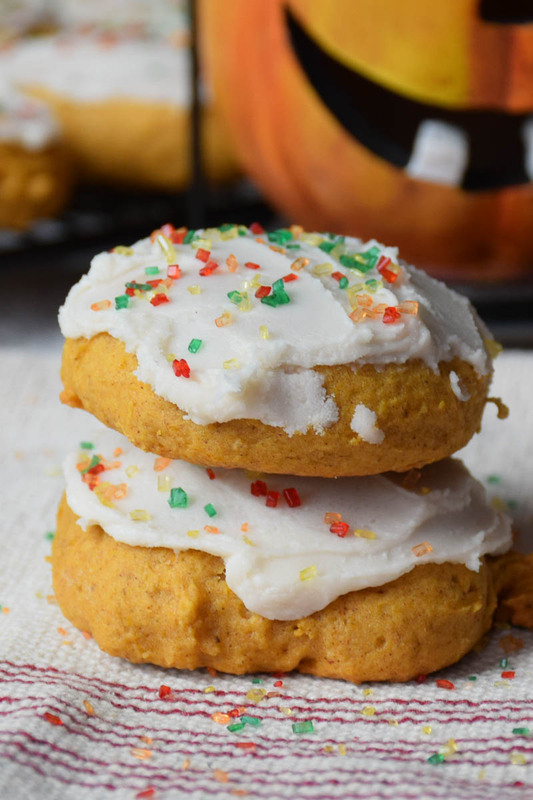 Pin Soft Pumpkin Cookies with Butter Rum Frosting! 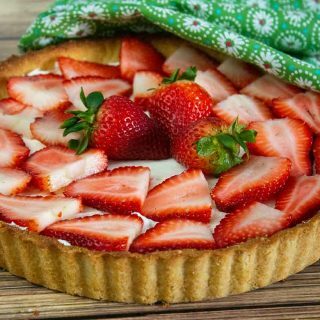 In a medium bowl, cream together the ½ cup of butter and white sugar. Add pumpkin, egg, and 1 teaspoon vanilla to butter mixture, and beat until creamy. Stir in dry ingredients. Drop on cookie sheet by tablespoonfuls; flatten slightly. 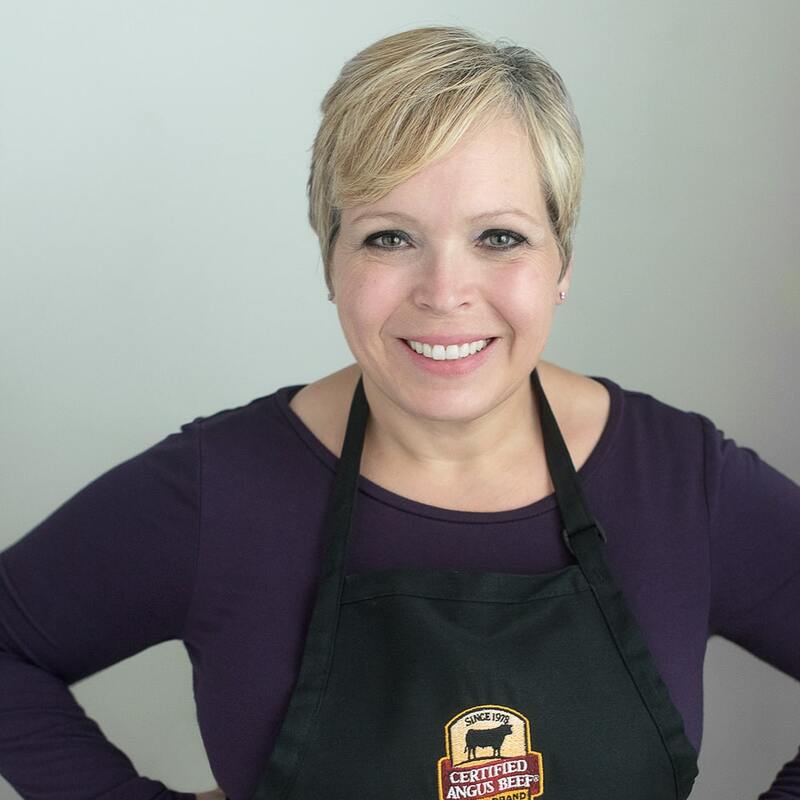 *tip: I flattened by using the back of a tablespoon that I had dipped slightly in water to prevent sticking. 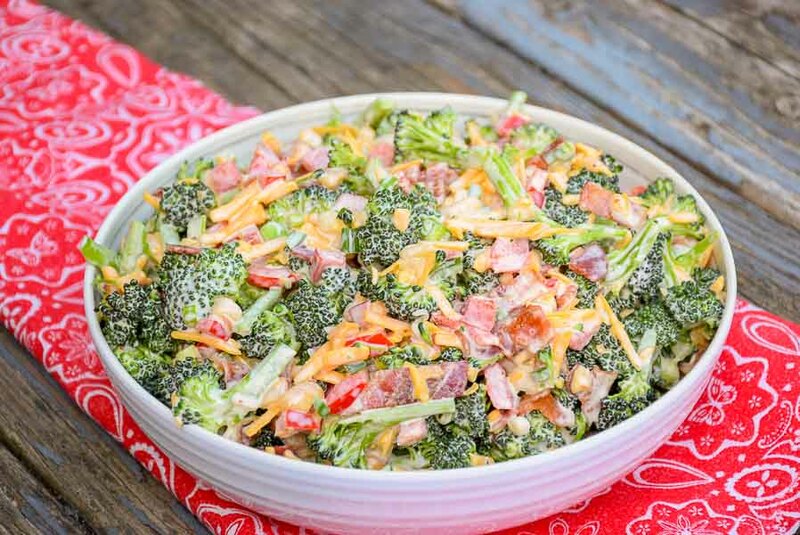 Bake for 15 to 20 minutes in the preheated oven. Cool cookies, then frost with icing. If you use more half and half you can just drizzle the icing. I wanted to frost and decorate with fall sprinkles! 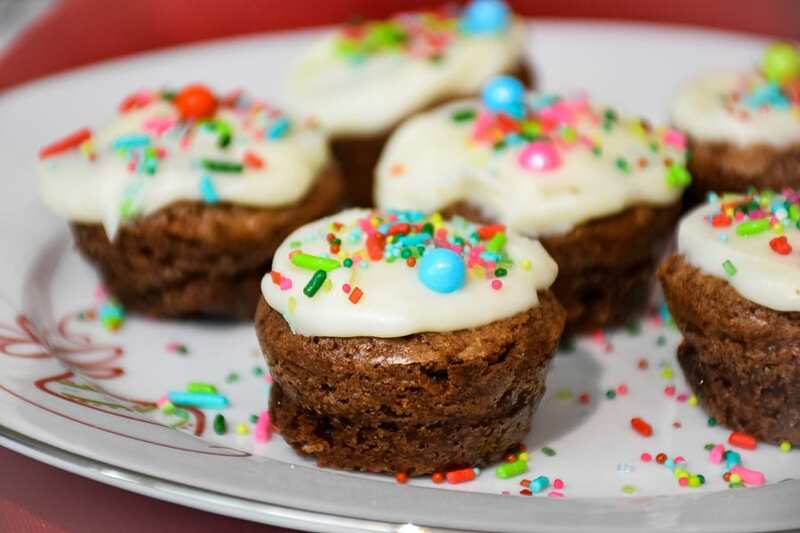 To Make icing: Combine confectioners' sugar, milk, melted butter, and rum extract. 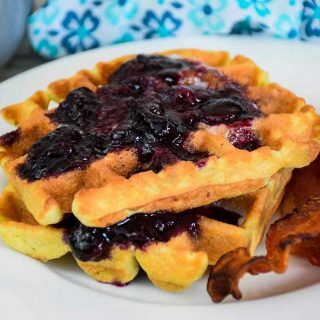 Add milk as needed, to achieve drizzling consistency. 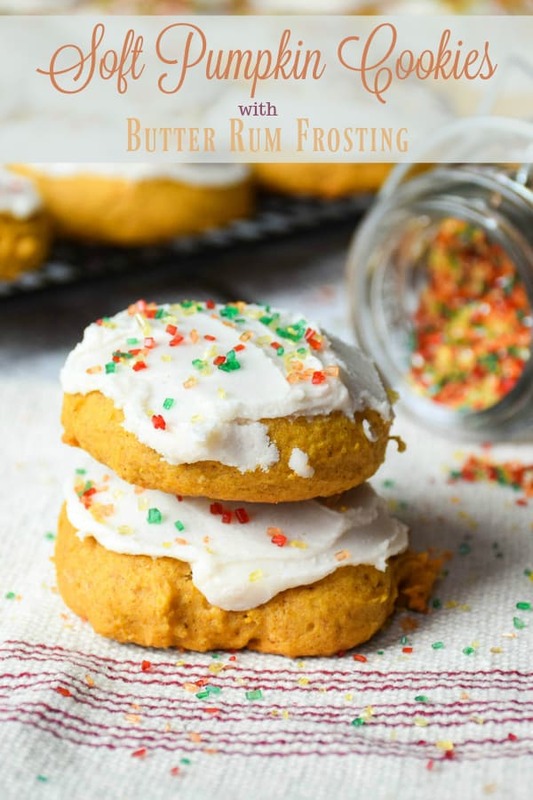 Pumpkin with Butter Rum Frosting…..Count me in! What a perfect fall flavor combo and slightly flattening the cookies with a wet spoon is brilliant! I love soft cookies like this! 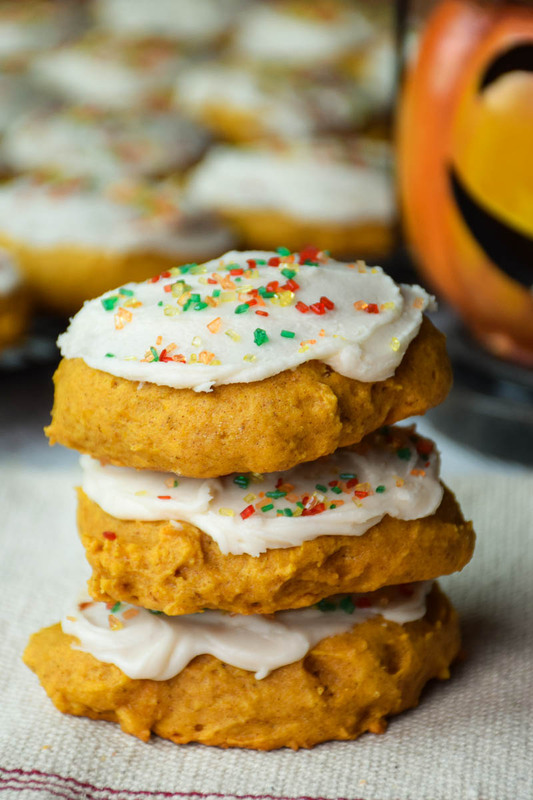 I love soft cookies like these and you captured all the best fall flavors!